As soon as mid-July hits, you can be sure I've already shifted from Summer to Fall. I'm ready to shop for sweaters, long sleeves, new jeans and more. 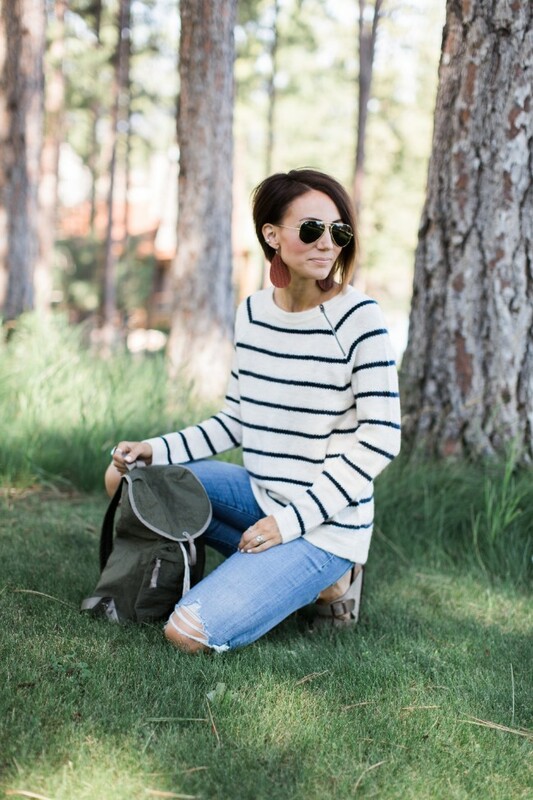 My brain turns to Fall colors, cozy knits, suede and distressed jeans. I don't even try to fight it. Cooler temps may not hit Missouri until later in the year, but I'll be ready as soon as they do, that's for sure. This year I got lucky because we headed north to Montana in late July and it's a little cooler there. The temps drop to 50 or 55 in the mornings and in the evenings, so Fall clothes were just the right thing for much of our trip. A lot of what I brought was from Abercrombie's Fall collection. I know it made plenty of people jealous of our cooler temps when I shared my fave pieces on Instagram. But, Fall is just around the corner, so you too can snag a few things, and you'll be wearing them before you know it. 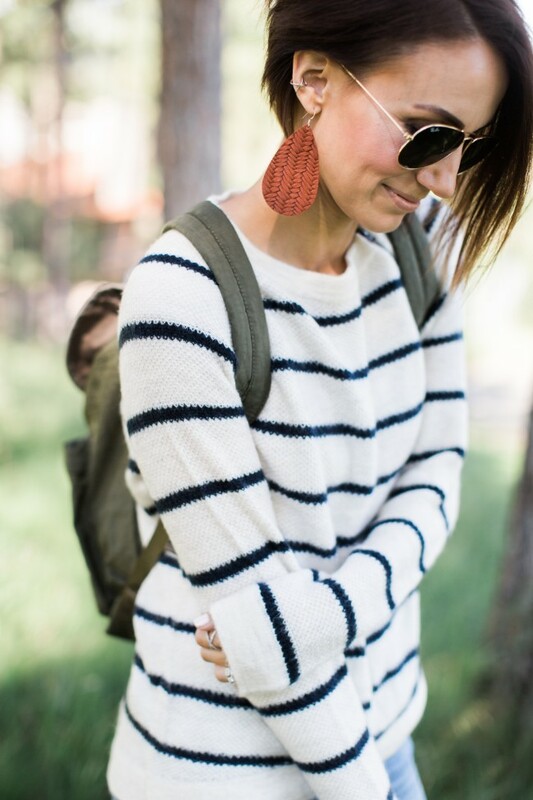 Mom's definitely need a little personal back to school retail therapy and Abercrombie has a lot of great stuff this season, especially their denim selection! I've talked a lot recently about designer denim, but if you want to find more affordable jeans that don't stretch out or wear out, Abercrombie is my number one recommendation. (I buy my kid's jeans there too!) You can often get their denim on sale, but it's always under $100 and they have so many options. I love this pair I'm wearing today because they have the perfect distressing, and they are super stretchy. I also love this pair and this pair. SWEATER: This sweater is over sized if you order your normal size. I'm wearing size small. 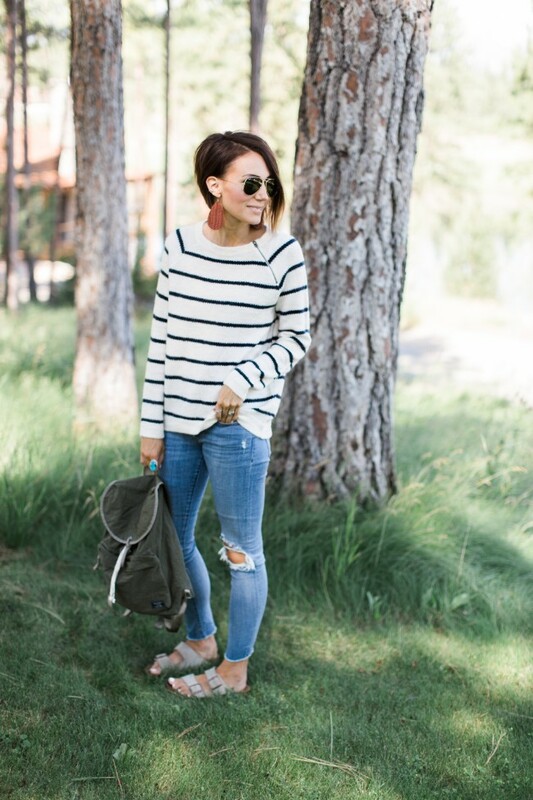 JEANS: Super stretchy, fit TTS. If in doubt you can always order up one size. BACKPACK: Love this as a little day pack. I brought it as a smaller "purse" to use daily on our trip. 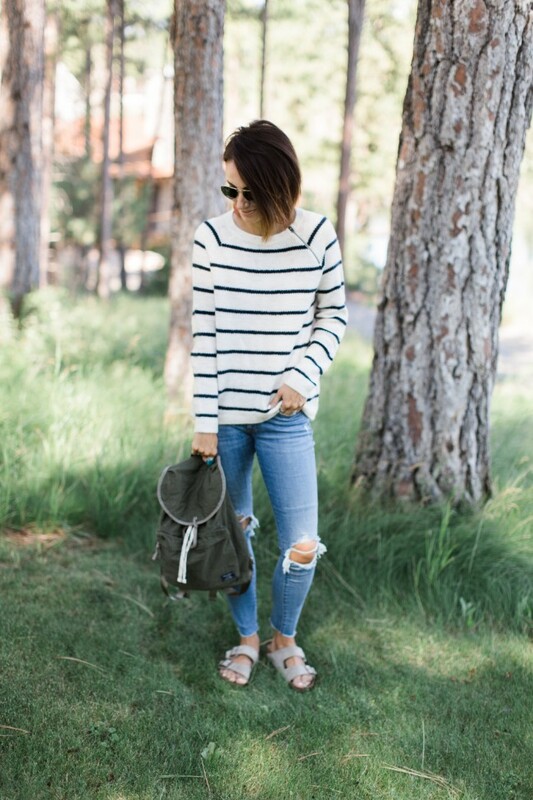 BIRKS: This is my favorite colorway in these sandals. They go with everything. Birks always feel a little floppy to start, but you get used to it. EARRINGS: I always wear size large. 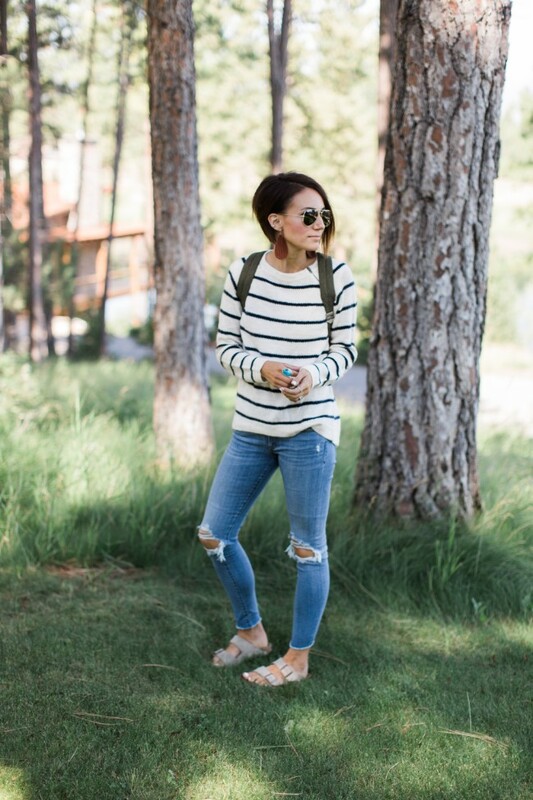 I'm loving so many new arrivals at Abercrombie right now and I've rounded them up below. If you haven't signed up for their rewards program I would recommend it. It's free and you earn points toward credit at Abercrombie. It also signs you up for their emails which is how I stay up to date with their best sales! Thank you Abercrombie for sponsoring this post. As always, all purchases and styling were done by myself.